You knew all that over-indulging during the holidays would cost you. But even if it helps you shed the pounds, is anyone really going to pay $140 for this set of weight lifting cutlery? 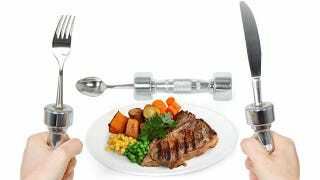 The chromed knife and fork dumbbells each weigh around 2.2 pounds, and just the two of them will set you back $109. But to really feel the burn and know you're getting rid of all those sugar plums and figgy pudding, you'll definitely want the spoon too, which weighs in at over 4.4 pounds.